On Sept. 10, 2015, VinSolutions made a difference. They may not have seen the actual impact that day, but by volunteering at Shawnee Community Services, they helped feed hundreds of people in need. This was not the typical work day for VinSolutions. Usually, the software company helps car dealers make connections with their customers through easy-to-use software, including mobile devices. Yet last week, they took a break from their normal routine, sending 13 employees to volunteer instead. 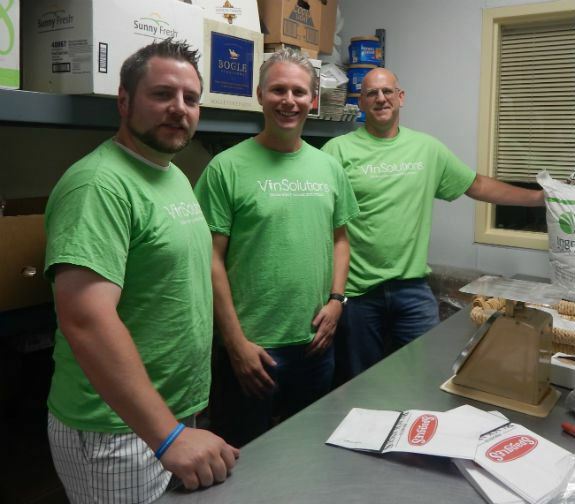 The VinSolutions employees helped Shawnee Community Services assemble snack packs, stock food pantries and complete meal preparations for the upcoming weeks. Through these types of service, SCS has worked for over 30 years with like-hearted volunteers to feed and clothe Kansas City area residents. They could not do it without the wonderful help from people and companies just like VinSolutions. “My guys had a great time and they definitely felt like they contributed," VinSolutions' Jennifer Rens said. "We'll be doing that one again." To receive more information on how to sign-up you and your co-workers for our Corporate Cares program, contact outreach@thecallkc.org. IMPACT STATISTICS - IN JUST 2 YEARS, THE CALL KC HAS HELPED 1,851 VOLUNTEERS COMPLETE 5,119 SERVICE HOURS FOR 54 DIFFERENT CHARITABLE ORGANIZATIONS.